It takes a lot for me to like an eye makeup remover. It can't be greasy, or leave behind any residue. It has to get off even the toughest-to-remove mascara -- even when I've basically shellacked it onto my lashes. It needs to remove every single trace of glitter and shimmer from my eye area -- because I'm a gal who likes the glimmer! And above all, it can't irritate the skin around my eyes and leave it red or raw. 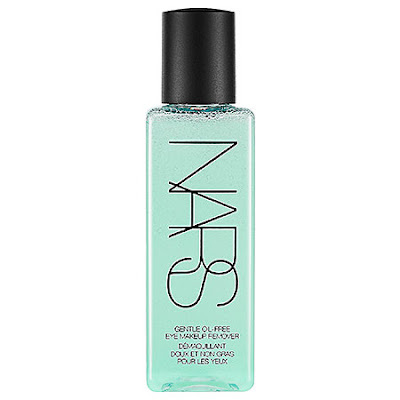 With that being said, NARS Eye Makeup Remover is my new favorite. The cheery turquoise liquid is formulated with both oil and water, and enriched with aloe and cucumber, to both remove makeup and make skin feel totally revived and rejuvenated. And the best part? A couple shakes on a cotton ball is enough to remove the makeup from both eyes! NARS Eye Makeup Remover retails for $25 at sephora.com.